Daniela Sheinman’s monumental installation,” Venus Rising from the Sea”, 1997, was created as an homage to Sandro Botticelli’s best known masterpiece, “the birth of Venus”, 1482-84. It incorporates old and new elements- a practice characterizing Sheinman’s work in general. The installation centerpiece is triptych of Venus in blue, green, and pink, which took her eight months to complete during a personal crisis in 1988. ” My bond with Venus” says the artist, ” started when I was undergoing crisis. I saw the motif of the birth of Venus as a metaphor for the change that was taking place in me”. The large painting, in acrylic on canvas, is placed in a quasi- cupboard, quasi- altarpiece box reaching towards the ceiling at the end of a wooden gangway. Venus rises from the sea and walks towards the viewer on a ten meter long gangplank. 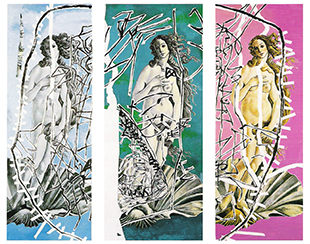 Painted with graphite on canvas, different variations of an almost life-size full image of Venus are exhibited in a separate display area. She fills the visual fields and appears to be closing in on the viewer. The monochrome black and white figures create a sequence of images of Venus rising from the sea, expressed in a new visual language which create anew environment. In this space as well as in the installation Sheinman breaks through the two dimensional boundary of the work, treats the visual space and creates a new territory. The environmental work generates a rhythmic sequence of figures that produces the complete picture. The linear variations on the figure of Venus look either veiled, or doubled, or reminiscent of a martyr. The linear painting highlights Sheinman’s homage to Botticelli, the great master of linear painting. Design: Studio agol Technology: lama-lo? !